Democratic Party Factional Struggles on Hold for Midterms? There are concerted efforts to reach left-center unity. 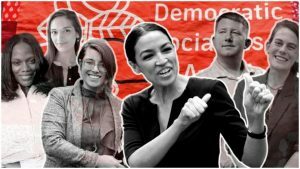 Stories of Democratic civil war and intra-party factional intrigue are all the rage these days, with commentators parsing the latest Democratic Socialists of America candidate’s primary win or centrist Third Way conference for a signal as to which side is winning the battle of ideas. At the Netroots Nation conference meeting in New Orleans this week, there is certainly plenty of evidence of ongoing tension between progressive grassroots activists and the Democratic Party “establishment,” but there are also concerted efforts to showcase attempts at left-center unity. 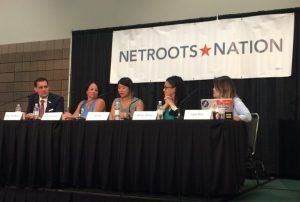 Local activist group leaders appeared on stage with DNC and state party officials at one opening panel of the annual Netroots meeting—the 13th and largest ever—in an attempt to demonstrate that the Bernie-Hillary battles of 2016 are, at least partially, on hold so as to ensure Republicans are turned out of office up and down the ballot. And across the country, state legislative races are where much of that action is taking place. Lala Wu, co-founder of the volunteer coordination group Sister District, is a self-described “state legislature evangelist.” That’s where progressives can get the biggest bang for their buck, she says. Her organization draws on the old “sister city” cultural exchange concept to pair activists living in safe Democratic areas with volunteer-starved campaigns in toss-up districts. In 37 states, electoral districts are drawn by the state legislature, so “if you want to do anything about gerrymandering,” she argues, “this is the only place to do it.” Longer term, though, state legislatures are also “incubators” for deepening the Democratic bench nationally; young elected officials learn and grow at this level, readying themselves to make a difference in higher offices later on. And as right-wing groups like the American Legislative Exchange Council (ALEC) have shown, the states are also laboratories for public policy—an example the left needs to study closely, according to Wu. The influx of first-time activists moved to action by Trump’s victory two years ago has left organizations like Sister District and Turn PA Blue having to integrate political novices into the ecosystem of the Democratic Party. That’s not the only challenge for the new activist collectives popping up in the wake of 2016. 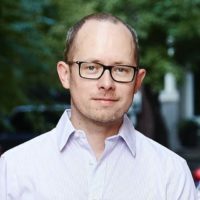 North Carolina State Rep. Graig Meyer runs Our Shot, a candidate-recruitment effort aimed at taking back seats at all levels in his state. One of the biggest roadblocks disrupting relations between grassroots groups and the party structure is, perhaps surprisingly, misunderstandings of complex campaign finance laws. That’s the kind of training—along with “talent banks” and effective data-driven resource deployment—which the Democratic National Committee is trying to deliver to its state party chapters. DNC Director for States Allison Zelman says it is the states, not Washington, where the best grassroots/party partnerships are being forged. She highlighted Missouri’s right-to-work referendum and a recent African-American leadership summit in Atlanta as examples. But after the official presentations ended, comments and questions from the audience showed that the struggle for ideological control over the Democratic Party’s messaging and platform is not even close to being over. Susan Smith is on the board of Progress South Carolina, the Working Families Party, Planned Parenthood, and Our Revolution. When it comes to progressive politics in the South, she’s involved in just about every group of consequence. 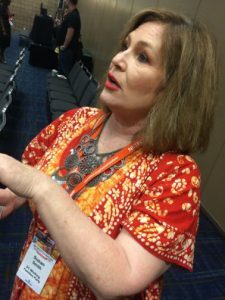 But she also knows the state Democratic Party inside and out, having been a member of its executive committee and a leader of the Democratic Women’s Council. For Sean Frame, a school board member from El Dorado, California, the problem with the party in his area is one of hopeless defeatism. There are ten Democratic Central Committees in his district that haven’t won a race in decades. “They have a mindset of ‘we will just run someone, but we won’t win’,” he says. The party just goes through the motions of putting up a candidate but doesn’t invest any significant efforts to building up organizational capacity. The party, according to Frame, has resigned itself to permanent failure in the face of Republican dominance. The divergent narratives coming from the speakers on the one hand and audience members on the other served as an unintentional metaphor of the theme of the panel itself: navigating the still-raw ideological rifts of 2016. 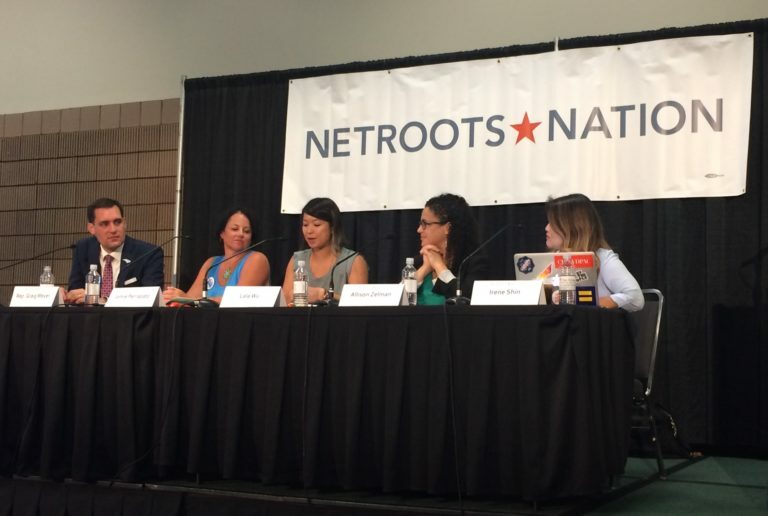 Make no mistake though, everyone at Netroots Nation is operating within the Democratic Party tent. There’s little if any talk of a real third party or of actually bolting from the electoral infrastructure that the Democratic ballot line provides for activists to advance their policies. But the factional battle for control of the party’s program and direction cannot be papered over. When one speaker at a later keynote session asked delegates whether they felt Democratic Party leaders in Congress were listening to the grassroots and representing them, only four hands went up in a hall of over a thousand people. A surging social democratic grassroots trend is increasingly challenging the party’s long-dominant mainstream liberal faction for leadership. In one Netroots panel after another, there is a recurring argument on the part of the insurgents that the centrist, establishment way has been tried and failed. The overwhelming feeling among attendees seems to be that it’s time to try something new. Originally published by People’s World under a Creative Commons Attribution-NonCommercial-NoDerivs 3.0 United States license.